Ryan and Sarah’s story continues in this intriguing puzzle-solving ghost hunt across America! Ryan is resigned to settle into a quiet (okay boring) summer in the now wealthy small town of Skeleton Creek, working in his dad’s new fly fishing shop, and spending lots of time reading and writing on his lonely front porch. What’s that? Where is Sarah? Sadly, his best friend has moved far away, both sets of parents agreeing that keeping the teens separated keeps them, well, alive. If you’ve read the first two Skeleton Creek books, you know these two do tend to get neck deep into deadly dilemmas. Though they are physically separated, the two friends are very much in e-contact. Finally, Ryan drops the bomb. Despite being deeply afraid, he shares with Sarah that he found a mysterious envelope “left behind” at the old gold dredge, inspiring her to embark on a Haunted Road Trip from Boston to Los Angeles. Now how on earth did Sarah pull off getting permission from her protective parents? Well, not only is she no longer hanging around with Ryan in Skeleton Creek, but she gets accepted into a summer film school program at UCLA (yay). She sells them on the idea that if she can create a video diary of locations along her route to California, it will be the best student film project EVER. 🙂 Her parents agree only because they have no clue of the dangers involved since each road trip location was chosen due to its direct connection to not only the Ghost of Old Joe Bush, but even more dangerous, the secret society of The Crossbones. And The Crossbones are watching. Though Ryan’s leg is completely healed, he still ends up being the one stuck at home, frustrated and bound to his obligations while Sarah takes most of the real risks. Digging up graves (ew), sneaking around haunted high schools (yikes), coming face to face with a ghost in a mirror (um, no thanks)… spa-ookie stuff! But after that horrendous betrayal by Henry, Sarah is a bit more discreet in her videos to Ryan these days. She never shows her face, but in addition, she’s becoming quite the professional filmmaker on her journey to UCLA. A documentary of each haunted location is posted so the reader can learn a little history while they get the pants scared off of them. (I swear after watching all these videos I jump a lil’ bit every time a crow caws). Similar to the first Skeleton Creek videos, we see Sarah in the field, exploring and uncovering clues, but in this leg of the journey we get to view more old, scratchy footage of The Apostle himself. The Apostle is seriously scary, in that, he seems like a total whack-job, yet he warns of an even greater threat… THE RAVEN. Like they didn’t have enough to worry about with double crossing, vengeful Henry on the loose and the real Ghost of Old Joe Bush floating about allegedly possessing people. Okay, it does seem that the ghost is more or less benevolent, maybe even friendly toward Ryan and Sarah, but you just never know for sure. Ghosts can be so freaking touchy about their gold and stuff after they’ve been murdered and all. The story takes a few unexpected turns, not the least of which is that Ryan’s mom is a major Bon Jovi fan. Patrick Carman fans get another giggle as Sarah discovers “wonderful waffle houses” on her cross country road trip. But Ryan finally takes manners into his own hands and risks everything to find the final piece of the puzzle… is the enemy much closer than he ever imagined? This story will continue as we eagerly await Skeleton Creek Book IV, The Raven. Burr-ring it! Patrick Carman does it again with yet another amazing multimedia adventure. Multimedia is storytelling in a variety of media. Carman cleverly combines a book, Ryan’s journal, with videos on Sarah’s website directed by Jeffrey Townsend, and now even Facebook pages to enhance the story as it continues. Ryan and Sarah are on Facebook! You can totally interact with them… how cool is that! Keep them coming Mr. Carman! Purchase The Crossbones (Skeleton Creek III) from Amazon! Can you face the Glyphmaster? Log on to Patrick Carman‘s TRACKERS Missions Interface and find out! Are you quick enough for the CHROMATIX? Trackers are challenged to do a lil’ online research to fulfill their missions. For example, who invented the cell phone? Humm… to find out, click the RESOURCES tab, choose “The Sphere” and click on, let’s say, Wikipedia when it rolls around. Good choice! But maybe, you need to zero in on a location…. well, we have our own Trackers GPS at our fingertips! Mission accomplished! Now you can relax and play the games, try to beat the top 10 high scores, and you can jump in the Discussion Hub to get game tips, catch up on Tracker news, or get to know other Trackers. But wait, there’s more…TRACKERS is a book too? 🙂 Correctamundo. Not only a book… TRACKERS is a vBook, baby! That’s what multimedia storytelling is all about! Grab your copy of Trackers #1 from Amazon! Shhhh! The Crossbones is an old, secret society hiding in plain sight in spooky Skeleton Creek…. 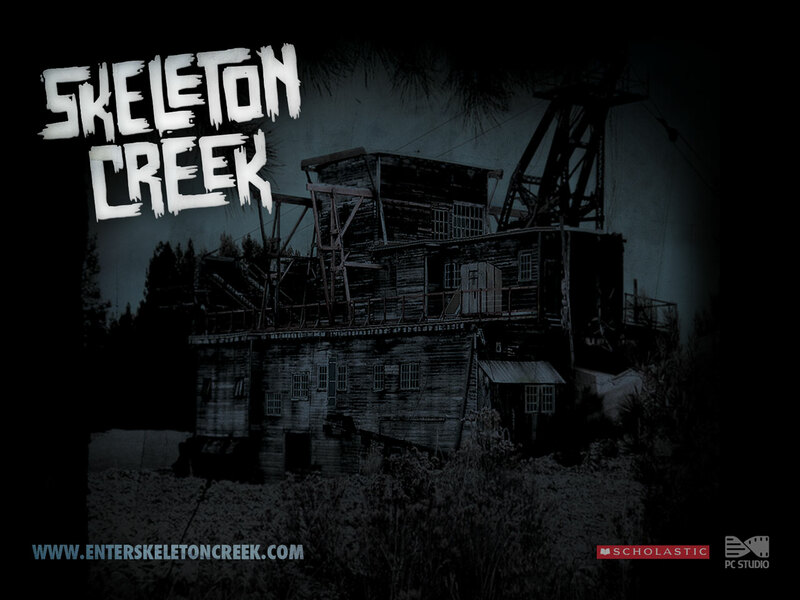 And if you dare, follow Skeleton Creek Investigations on Facebook. Some major creepy goings on there! Avast Ye me huntr’ hearties! Join th’ adventure wi’ th’ swashbucklers o’ th’ Caribbean! The Pirates of the Caribbean were Cahills? Arrr. As The 39 Clues book 8 The Emperor’s Code drew to a close, Dan and Amy discovered that the legendary 1700’s pirate Anne Bonny was the spitting image of their deceased mother Hope Cahill. So with Egyptian Mau Saladin and their protective au pair Nellie Gomez in tow, the clue hunters board a plane from Beijing to Jamaica in search of the next of the 39 clues. That is, after Dan persuades them to stop in the Bahamas on the way just to be sure they didn’t miss anything, you know, important, like the Oceanus water park. Yeah baby! A tip from Hamilton “Hammer” Holt becomes its own “storm warning” that they need to finally confront faithful Nellie once and for all with their growing suspicions. Sadly, we learn she does indeed harbor some secrets, one being that she was interviewed and hired by their beloved grandmother Grace Cahill herself to be their au pair for the clue hunt, but nothing changes the fact that Nellie loves Dan and Amy and has risked her own life to protect them. Amy in particular is devastated that Nellie may not be who she seems and throws a major wall up between them. Nellie is upset, but stubbornly sticks with her job to keep them safe no matter what. If they don’t like it, they can go back to their Aunt Beatrice. ACK! While Dan and Amy receive a mysterious message to explore beach front caves during high tide, we get a glimpse into the nightmares of young Natalie Kabra… Is the loyal daughter of the murderous ice queen Isabel Kabra having doubts about her “perfect” mother? And while we’re on the topic, how come Isabel’s son Ian can’t look her in the eyes anymore? Is the Lucian house dividing against itself? Now in breathtaking Jamaica, Dan, Amy and Nellie discover the legend of Anne Bonny and Mary Read as well as the life of pyrate Calico Jack Rackham by studying trial records in Spanish Town. Could it be there is more to Amy’s jade necklace than they realized? Then author Linda Sue Park takes us on an unexpected twist, in that Dan and Amy decide to turn the tables on the Kabras, big time. Miss Alice’s son Lester guides them to Saint Peter’s Church in Port Royal to explore the 17th Century Sunken City, where they discover a treasure which ends up being a challenge of Möbius proportions. But this time, the price is too high for our orphan clue hunters, forcing Nellie to play her full hand. Just who was Madeleine Cahill and what is the true role of the Madrigals? So much hangs in the balance as we eagerly await The 39 Clues Adventure Series finale in book 10! Of course I want all the answers, but I so don’t want it to be over!!! Whaaa! As you well know, The 39 Clues is a multimedia storytelling experience, so in addition to the 6 new playing cards that were carefully removed from the inside cover, I also acquired the next Ultimate Card Pack for books 9 and 10. Logging into the 39 Clues website, all my new cards were added to my online collection, Mission 8 was completed AND I created my own secret agent card and shared it on Facebook with my fellow clue hunters! (Psst it’s P2GW6NJDXP) Hey, if you haven’t logged in lately, there are new fun features… a global map showing the exact location of all the clues AND a nifty book section, which enables you to solve the book puzzles and earn more replicator cards. Wu-hoo! It won’t be long now until all is revealed in book 10 Into the Gauntlet, however, heads up this fall… The Black Book of Buried Secrets by Rick Riordan! Catch you on the Clue Hunt! Purchase book 9 Storm Warning , Card Pack 4: The Ultimate Card Pack and The Black Book of Buried Secrets from Amazon! Book One: Adam Henderson is to be interrogated by mysterious persons unknown, surrounded by video cameras, audio recording devices and the classic two-way surveillance mirror. We know not what has transpired, but Adam makes two things undeniably clear, 1) he is only going to do this once, and 2) he and his friends are Trackers NOT hackers. Hackers break into places and mess them up. The Trackers tried to help keep people safe. But somehow, something has gone terribly wrong. A child prodigy (but he really hates that word), Adam began repairing computers in his father’s Henderson’s Chip Shop around age five and by age eight he could fix anything. For his 9th birthday, he was given “The Vault”, his own private lab with all the spare computer parts he needed to create “The Waffle Iron” which had more band width than the Pentagon. But Adam didn’t use his skills to steal or cause harm… he alerted companies about security breeches and invented cool gadgets. Way cool. Adam eventually acquired mass quantities of virtual dollars and was wired to the whole world… what more could a digital age kid want? Humm… well, that would be friends. Even a brainiac hermit like Adam might start to feel lonely as he approaches junior high school. Soon after Adam meets Emily and Lewis, friends of Finn’s. Now the cautious Lewis, being a geek himself, is well aware of Adam via his cyber-universe rep, and is already in awe of him. Emily is in awe of no one, but this tough little lady is extremely loyal to her friends. For the next three years, the four tech-savvy teen Trackers practice surveillance and code breaking, help out their Seattle community (while taking java breaks in The Grind House), and test Adam’s many fascinating wireless spy gadgets including the Belinski, Trinity, Deckard and ultimately, the Orville. (Any of those names ring a bell? Wink!) The Trackers can find almost anyone, anywhere, even the most skilled cyber criminals. That is until the frightening day when Adam realizes… someone is tracking THEM. Before long, they are in over their own heads, being blackmailed for Adam’s prized inventions by the world’s most notorious hacker. Can the Trackers out-track the evil Shantorian before it’s too late? Nothing is quite what it seems in this virtual reality story! And just like Skeleton Creek, Trackers ends on a cliffhanger! Noooooo!! In agony awaiting book two! New! Trackers mobile is live! Purchase Trackers #1 from Amazon! It was a gorgeous Southern California day at the Los Angeles Times Festival of Books 2010. William Wu Books is delighted to share a brief interview with Mr. Gordon Korman, author of The 39 Clues book 8 The Emperor’s Code and book 2 One False Note. Can you crack the Emperor’s Code? Before I read even one word to find out how poor Dan fared from the poisoning at the end of book 7, this clue embedded book, with its enchanting cover art, threw me into “code cracking mode”: auto-pencil and pad out, flipping through pages like a madman and deciphering the symbols on the inside cover. Heh heh… In case you missed the “sneak preview” of some of the Emperor’s Code Clues, click on the book image above. Now quickly back to Dan and his burns! Peter Lerangis revealed big secrets in The Viper’s Nest, so “spoiler alert” if you have not read it yet! As Gordon Korman, who also wrote book 2 One False Note, takes us on the continuing adventure out of Madagascar and into Beijing, the aloe vera treatment seems to have done wonders as Dan Cahill is healed and back on the clue hunt with his sister Amy, their mysteriously well trained au pair Nellie Gomez and of course, Saladin, their kitty companion. Their ambition to find the 39 Clues, as depicted in their beloved Grandmother Grace Cahill’s will, is overshadowed by recently revealed intel that they are not part of the Lucian, Janus, Tomas or Ekat branches of the Cahill family, but are descended from the feared Madrigals. Everyone knows that Madrigals are killers, traitors… the worst kind of criminals. How could their deceased parents, Hope and Arthur, be Madrigals! The orphans’ fragmented memories of their parents are of loving, wonderful people who were murdered by the evil Lucian Isabel Kabra. This painful information does not compute with the grieving siblings. Yet Amy, who is older and feels more weight and responsibility toward both the clue hunt and her little brother, cautions Dan to not rely too much on his memories. Dan, in a blind rage, runs away from his sister and her horrible words, determined to quit the stupid clue hunt 4EVER. Alone in China, 11 year old Dan is an easy target for the Kabras, who immediately kidnap and viciously interrogate him, but dump him when he reveals little useful information. However, Dan is a Cahill, cunning and resourceful, and not only outwits their plans for his fatal “accident” but protects the critical information he did discover in the Forbidden City before their monster argument. The clue hunters discovered that Puyi was not only the Last Emperor of China, but like many influential people from history, a Cahill. Amy and Dan, now on separate paths and unable to connect in China, must both pursue the clues left by the emperor in order to reunite. They rely on outside help – after Saladin “discovers” their Uncle Alistair, Amy and Nellie cautiously enlist his assistance while Dan runs smack into, yo, the famous Jonah Wizard, famous hip hop “Gangsta” cousin and fellow Cahill. While Amy is plagued with worry and guilt, Dan is living the high life hanging with the teenage rock idol. Jonah showers him with new hip clothes, Xbox games, über-snacks, hummer limos, private jets and penthouse suites. Not to mention hang’n back-stage at the Beijing Bird’s Nest Stadium. I’ll hand it to Mr. Korman, he sure mastered “Wiz Speak”, yo. Hilarious. Then it gets ugly, well, I mean, in addition to Dan being tortured under the orders of Isabel “the human worst case scenario”. Amy reasons that Dan could have made contact with their famous “cuz”… but when she and Nellie catch up to Jonah, he lies to her face, sympathetically denies having seen Dan. (And what do you suppose he’s telling Dan as the same time?). But why? Seems Dan and Amy have caused quite a stir in their unpredictable clue hunt success and now are seen as valuable assets. Jonah’s next move is to take Dan to the Shaolin Temple in Henan Provice. Alistair reads Chinese and easily uncovers Jonah’s deception, so Amy, Nellie & Saladin head for Badaling Section of the Wall of China in pursuit of the Wizard. Dan loves the Shaolin Temple, with all the shaved headed monks in orange robes representing 15 hundred years of super sweet kung fu fighting skills. He is even more ecstatic when he gets his own wushu lesson and learns about the 5th century monk Bodhidharma and the famous shadow stone. Rolling with “The Wiz” sure has its benefits, only, maybe Dan begins to see that even famous rap stars might have serious family issues. After getting ill sampling deep fried silkworm larvae, Dan gets some air in Pagoda Forest and spots a distant statue of Bodhidharma in a coin operated telescope. He remembers that Grace had a small replica of that very statue they called “Beard Buddha” and sneaks off for some clue hunting. Meanwhile, the Janus Monk leader, Jonah and his father have planned some clue hunting of their own in the Terracotta Army at the Tombs of Xian, and they are not above using Dan as bait. Checking into the luxurious Bell Tower Hotel, Wizard and company take over the entire top floor, enjoying private entertainment with plenty of Wiz media coverage. But later, the two Cahill cuzs steal into the night in search of the Terracotta Army clue, only to find it was a trap set by none other than the backstabbing Kabras… Jonah could have saved himself once things went terribly wrong, but proved he was “a Janus failure after all” since he went back to save Dan. Not the first time we 39 Clues fans have seen self sacrificing behavior during the otherwise cut-throat hunt. I’ve said this before… makes you wonder what the clue hunt is really all about. Back at the Bell Tower, a furious Cora Wizard is waiting for them. Jonah tries to tell his mother that he “quits the clue hunt”, and she slaps him. Dan realizes that Cora was involved in his parents death and that they have been pulling platinum wool over his eyes. So, you think maybe Cora has “Isabel potential”? Dan ditches the Wizards and later spots the Holts, on TV, climbing Mount Everest! He decides pursuing the Holts is his best shot at finding his estranged sister and only family. Back at the China Wall, Amy uses feng shui she learned from her grandmother and a luopan on the tower floor to figure out the clues left behind long ago. (Amy ignores the fact that Nellie is able to easily pick the tower lock). This “Indiana Jones” style clue leads them to… Mount Everest! Wow do those Cahills think alike! While Amy and Nellie find comfy travel to Tingri, Dan stows away on a slow train, eating dog biscuits and sucking down yak milk. But brother and sister are finally reunited near the helipad of an A-Star Chopper, the only machine able to withstand the altitude at the top of the planet’s tallest mountain. The pilot lands at the top and they begin digging in the ice for the Emperor’s clue. The highly conditioned and physically trained Holts are making their ascent to the top as well. As they enter the freezing dead zone, where you die one cell at a time, they are passed by none other than Ian Kabra, who is being carried in like, a space suit! Who knew, another Cahill family reunion, at the top of the world’s pinnacle! Just as Dan and Amy attempt to fly away with their clue, the incensed Eisenhower Holt pulls down heavily on their chopper, sending it spinning and spilling them onto the snow. In the pandemonium that follows, Amy learns a very important lesson about herself, and maybe being a Madrigal doesn’t define her after all. Safe, warm and reunited, Dan shows Amy a photo he found of a woman who strongly resembles their mother. They realize the woman in the photo is Pirate Anne Bonny, so it’s off to the Caribbean for book 9! As you well know, the 39 Clues is a multimedia storytelling experience, so I logged on to the website with my secret agent password and entered my 6 new cards (wu-hoo I have so many in my online collection now!) I’ll have you know I have completed all 7 missions. Whew! *wipes sweat off brow* And, I can feel the end of the 39 Clues coming… can you feel how close it is? I’ll be inconsolable when the books are concluded, 😦 but I can’t help eagerly anticipating all the final answers! Real footage of an A-Star climbing Mount Everest! This book was not what I expected. At all. When I first picked it up, I knew it was Patrick Carman’s first young adult novel and that it had something to do with super powers. My husband Bill is a comic book fan, so I had a fair idea of what a super hero story might entail, but the foreboding cover art had me pretty sure it would not include neon spandex. Whoa – the woodsie, mysterious cover was an understatement. By the end of the story, I was a little unnerved. There are some deeply disturbing moments, and some down right scary ones. Right away, the reader is challenged to start thinking. What super power would you choose? What would be the consequences? Trust me, you’re not likely to guess the horrible consequences of this super power. I’m not going to announce “spoiler alert” exactly, BUT, in this review of the super power, some of the story (but not all) may be revealed. So headzup! Jacob Fielding is a boy with several secrets. The most critical, newly discovered realization that he is indestructible, is the first secret he shares with best friend Milo and the dazzling Ophelia (Oh). However, he withholds the most vital and telling aspect – that when he passes the power to another person, it behaves more like a monster than a blessing. So… Jacob is indestructible, and he can pass it to any one person. Oh has the same reaction many of us might have… our comic book culture has conditioned us to believe if we are blessed with a special gift, we should use it to help people. Save the world (save the cheerleader). This is of course, assuming it is a “nice” power from the nebulous super hero world where powers are acquired by being a crash landed alien, or be bitten by a mutated spider, or heck, maybe you are super rich, smart and a tad touched, flying around at night fighting crime in a bat suit. But… what if your power isn’t from this universal place of goodness? What if it’s not a super power at all, though it’s easy to make that assumption with the indestructibility and all. Kinda Superman/ Unbreakable-ish, right? But what if “it” is actually an independent living being, summoned by black magic, wrestled into our reality long ago against its will, surviving by taking residence in the soul of a human being like a dark parasite? Um, so not the same. (And über-cool, btw). So since it’s here unnaturally, by force, its mere presence throws off the balance of life. Its host is cursed to live like an immortal, or a vampire (sans the blood sucking and sun phobia stuff), burdened until he chooses a new host (victim), then die. Curse. Not gift. So not. Therefore, by the end, I realized this is not a “classic” super hero story, at all. I just couldn’t tell if the it was more horror (monster? ), or paranormal (what IS the black lion? ), or even more frightening, like spiritual warfare (demon?). Now why would I say that? Well…. All I knew was that Mr. Carman was able to believably transform a hip, happy California hotty into a vicious corpse like monster, then back again. As the boys put the pieces together from Houdini’s invention, Mr. Coffin’s hints and Mr. Fielding’s notes, I was truly terrified of Ophelia James and would so not have wanted to run into Miss Death Obsessed in the woods. And I thought Joe Bush was scary! And even scarier? The awful truth of the only way to save her and set things right… that’s when Carman takes us down a really dark road. I was like, no, no NO! You’re not going there!! *Visual of the home-alone kid*. But “thar” they went… they had to. “God doesn’t make mistakes…” Disturbing? Yes. Upsetting? Quite. Did it make me think? Oh yeah. I was actually haunted for days after reading this book. I mean, in a good way. A book for teens? Definitely. For guys? Yes, it’s all from Jacob’s perspective, and nothing makes that more clear than when he catches his first glimpse of the curvaceous blond. For girls? Oh yes, teenage girls will be able to relate to Oh as she is desperately driven to help people, has a new boyfriend who is inexplicably resistant to this need, but then unable to deal with the foreign emotions as the Black Lion invades her soul (isn’t that like the definition of a teen?). Responsibility? Readers experience that heavy weight – who lives, who dies, who are we to decide? And what was the real reason Jacob was adopted…? I was happy (okay, relieved!) with how this story ended. The teens were left with at least ways to “deal” and move on. But so much more could happen in a sequel (and a prequel!). Maybe find out what the Black Lion truly is, where it came from and, I dunno, send it back? 🙂 What was taken from our world in its place all this time? And more more more back story with Houdini and magic (yeah baby!). Creepy! Why are we looking at the inside of a wrecked car? Like many of Patrick Carman’s books, Thirteen Days is multimedia storytelling! At this time, included are a Facebook fanpage and a game website so the story continues! Click here to see the ongoing 13dtm Alternate Reality Game (ARG) Can you find the objects in the car? What story do they tell? Click here to see the new Thirteen Days fan site! Purchase Thirteen Days to Midnight from Amazon! Multimedia Storytelling Evolving into Alternate Realities? Hey, in this wired age, anything is possible! And it’s so happening! When we reviewed The Amanda Project (TAP) a few months back, we were delighted to discover how after reading book one Invisible i, the TAP fans made the leap to the website where the story (and writing contest) continued. I was taken aback by the fans’ enthusiasm and the creativity in their online writing. Confirming the rumors that teenage girls in particular love to express themselves. I’ll say! Not only is this rolling as we speak, but how about taking it to a whole new level by using FB to have a character from a book call a live meeting with the fans as part of the story? With a Web-cam! I’m not joking, it just happened to me… I received a message via Facebook to click a link to a meeting, and then watched live as a video conference took place, with fans calling in, emailing, etc. Cannot get anymore interactive than that! Of course, once the meeting adjourns, we then have access to it in video form. Sweet. Who is doing this and how can you jump in? Right now, Skeleton Creek Investigations has not only its own FB fan page, where fans are given clues, puzzles and even tasks to sharpen their investigative skills, but the main characters from the novels Ryan McCray and Sarah Fincher have their own friend pages. Not fan pages, but friend pages! And yes, you guessed it, the live video conferencing meetings (The You Show) are part of Skeleton Creek Investigations as Ryan and Sarah continue to explore the mysteries of the haunted dredge. After “going to” the meeting I noticed that there is a livestream chatroom in The You Show (TYS) site – yet another level of social multimedia! TYS – It’s All About YOU!!! I searched and my beloved Cathy Vickers (from the Cathy’s Book trilogy) also has a FB friend page…. in FRENCH. Okay, so I can’t read it, but I joined! TAP has a great FB fan page with puzzles, prizes and more… And the Ghostgirl (cuuuute books!) FB fan page has more contests and fun interactive activity, but no one is doing anything like Patrick Carman’s live video conferencing! Yower! So once we start evolving beyond book storytelling in the multimedia universe, we can enter the realm of alternate realities where readers can add to the story in some way or interact with the characters using real world media… vmail, email, chatrooms, texting, etc. Depending on the content, some are referred to as Alternate Reality Games (ARG) while Thirteen Days to Midnight (coming soon) is described as an Alternate Reality Experience (ARE). Young and would be reluctant readers are eating it up while expanding their reading… and writing! Anyway, with the recent flurry of activity in Facebook, just thought I’d mention that multimedia is a fun wildfire out of freaking control. Jane, stop this crazy thing! Ah come on… join some of the pages and the fun! Post Scriptum: Now Skeleton Creek has its own live-stream meeting!